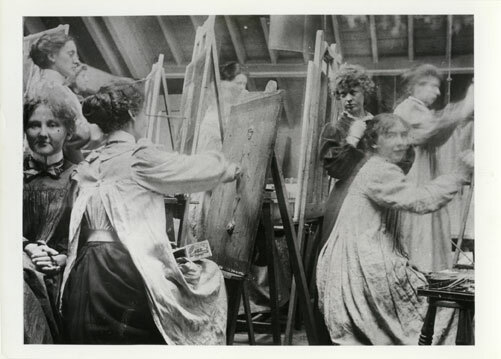 Yesterday was International Women’s Day and we’ve been sharing some stories of inspirational women artists and designers who have links to the Glasgow School of Art and for whom we have material in our collections. Ann Macbeth: Photograph (GSAA/P/1/1); China Tea Service (NMC/233); and GSA Banner (NMC/417). Firstly we featured Ann Macbeth, renowned designer, embroiderer, and ‘Glasgow Girl’. She was also a very active member of the suffrage movement. 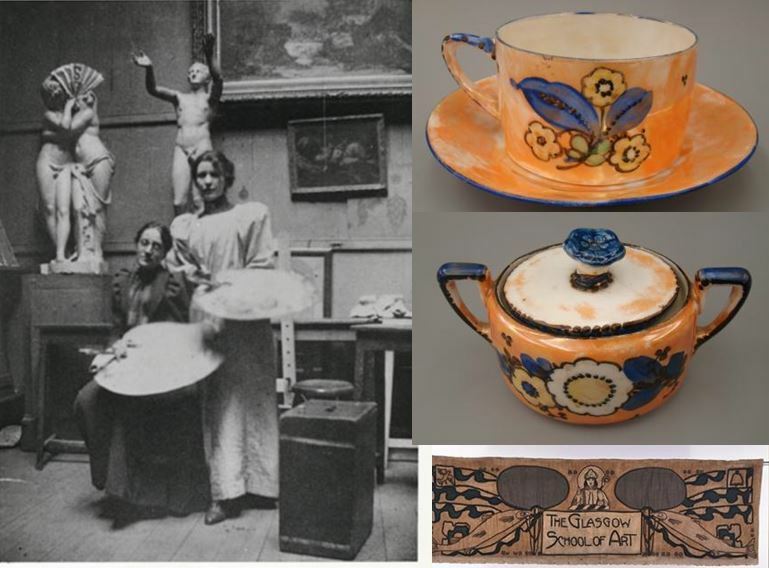 She studied at GSA from 1897-1909 and we hold some of her work in our collections including a china tea service (NMC/233), a Glasgow School of Art Banner (NMC/417), and letters describing her experiences of imprisonment because of her work for the suffrage cause, including forcible feeding (SEC/1). Ann Macbeth is often noted as Jessie Newbery’s most talented student who later played a key role in the history of teaching at the School. In 1902 she was appointed to the position of Assistant Mistress, teaching courses in needlework, embroidery and applique, in the Design and Decorative Art Section. She continued to teach in the Glasgow School of Art until her retirement in 1929. In the library you can see a rare example of a bookbinding designed by Ann Macbeth, more information about which can be found here, and several of her teaching books have been digitised here. 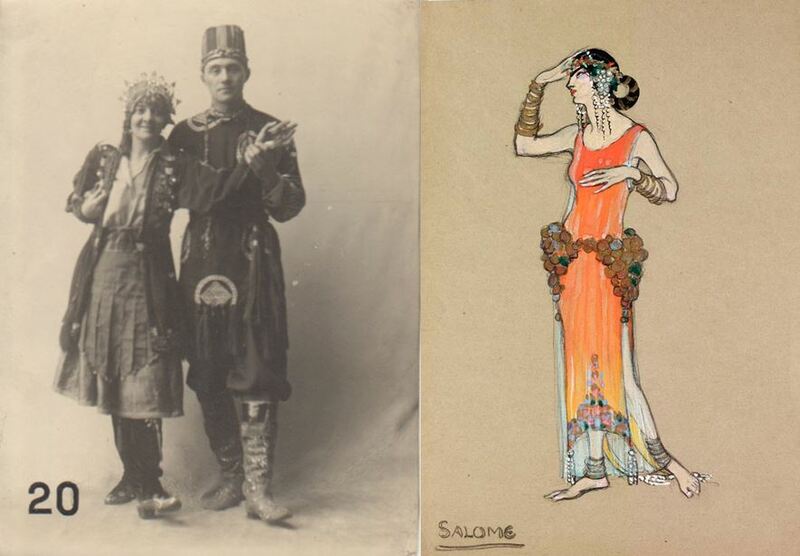 Dorothy Carlton Smyth: in costume (PSAA/P/1136) and her costume design for Salome (NMC/098C). Next we shared the story of Dorothy Carleton Smyth, a student and staff member of GSA from 1898-1903 and again from 1915-1933 when she concentrated on Costume, Lithography and Book Illustration. As a student Smyth’s principal interest as a student was theatre and costume design and she was very involved in designing costumes for the Art School’s ‘Masques’. In the Archives & Collections we hold a number of breathtaking costume designs by her and a brilliant photograph of Smyth in costume herself! In between her years at the School of Art, Smyth worked with F R Benson, a Shakespeare producer, as a costume designer for his touring company. Between 1904-1914 Smyth continued to work in costume design in Glasgow, London, and Europe until her return to the School in 1914. In 1927 became she Head of the Pictorial Section of the School of Design and specialised in teaching Illustration. Smyth was offered, and accepted, the position of Director of the Art School in 1933 but tragically died before she could accept the post. 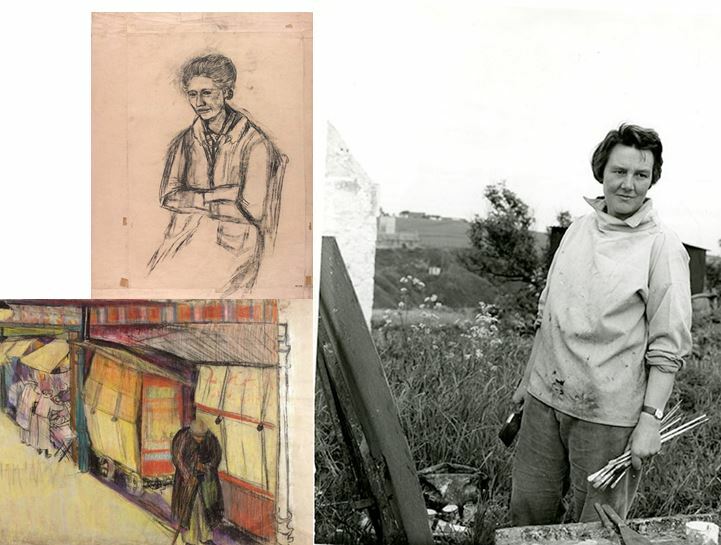 Lastly, we featured Joan Eardley, one of Scotland’s most famous 20th Century painters. Eardley studied at GSA between 1940-1943 and was awarded the Guthrie Prize for portraiture. She returned for her postponed post-diploma scholarship and in 1948-49 she was able to travel to Paris and Italy on a travelling scholarship. In 1955 Eardley was elected an Associate of the Royal Scottish Academy and was made into a full member in 1963. At the time, she was the youngest female artist to achieve this! We hold many of her studies created during her travels within the collections as well as several photographs of Eardley at work. These are only a few of the many examples of inspirational women who have been through the doors of the Glasgow School of Art and who have shaped the teaching of the School. If you would like to access any of these collections for your own research, please do come and see us at the Whisky Bond. E-mail us to make an appointment: archives@gsa.ac.uk or telephone 0141 566 1418. Happy International Womens Day 2018!